Activa Graduated Therapy Thigh High Unisex Uni-band Top 20-30 mmHg Compression Therapy Stockings are manufactured by one of the leading Compression Stocking companies, Jobst under the brand name Activa. Designed as a unisex sock for both men and women, these Thigh High Stockings are easy to don or doff. Activa Graduated Therapy 20-30 mmHg Compression Unisex Thigh Highs with Uni-Band Top relieve ankle and foot swelling, chronic leg fatigue, venous stasis ulcerations, and post-Sclerotherapy using a graduated compression of 20 to 30 mmHg. Designed to increase leg circulation, the fabric is strongly constructed with a reinforced foot and heel area for greater durability. Activa Thigh Highs feature a comfortable Uni-band Top with silicone grippers to keep these compression stockings in place. The heavy fabric is breathable and cool to the skin. 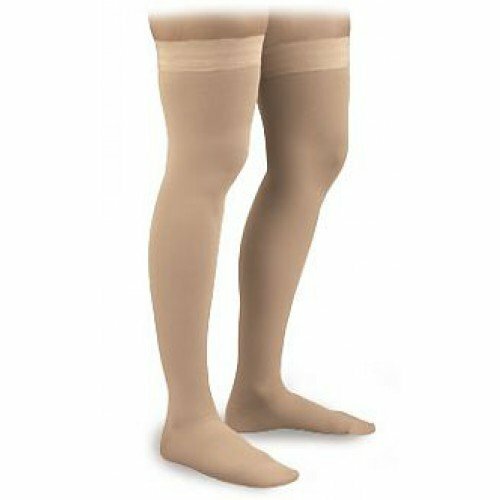 These Activa Graduated Therapy Thigh High Unisex Compression Stockings use traditional, non-sheer fabric. Activa Graduated Therapy 20-30 mmHg Unisex Thigh Highs with Uni-Band Top are sold in pairs and are available in beige or black colors. The best stockings I have had in terms od durability and firmness of the gripper. I think they also look nicer than the picture. I have used the beige thigh-highs for a while without any problems. After using a sock in black for just one day, however, I developed a severe rash the entire length of the leg up to the top of the sock. I do not have a latex allergy and I had laundered the sock before use and I only use them on one leg so it was obvious the sock was the cause.